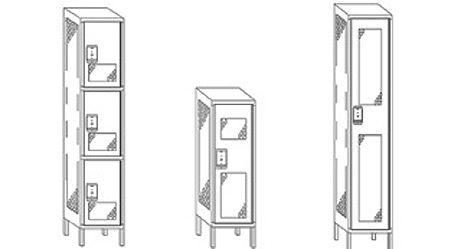 Competitive Series lockers are ideal for applications that require ventilation and strength, or where visual inspection of the locker contents is required. In this series, doors are made from 14 gauge steel, sides, tops, bottoms, and shelves are 16 gauge steel, and backs are 18 gauge steel. Doors and sides are perforated with diamond perforations allowing maximum air circulation and at the same time maintaining security. 2.2 Door Frames: Shall be 16 gauge formed in a channel shape. Vertical members shall have an additional flange to provide a continuous door strike. Cross frame members should also be 16 gauge channel-shaped, including intermediate cross frame members on double and triple tier lockers. 2.3 Doors: Shall be 14 gauge, channel-shaped on both the lock and hinge side with angle formations across the top and bottom. Single, double and triple tier lockers doors shall be 16 gauge full height reinforcement channel. 2.4 Handles: Shall be one piece 20 gauge deep drawn stainless cup designed to accommodate locks.